Hair: Black, straight and far longer than she is tall. Eyes: Green, though they seem multi-hued at times. 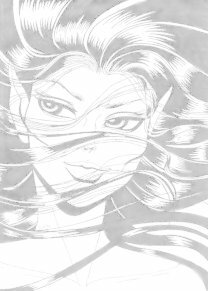 Life history: Winnowill is without doubt one of the most interesting characters in the Elfquest universe. Although she basically represents pure evil, there is much more to her than just that. Winnowill's life started fairly soon after the High Ones' arrival, with her probably being a Firstborn. Like many Firstborns she feared the influence that this strange World of Two Moons had on the elves, and she joined Lord Voll as he took refuge within Blue Mountain, the inside of which was shaped and manipulated in imitation of the Palace of the High Ones. Winnowill was Lord Voll's lovemate and supporter, as well as the Gliders' healer. After some time, however, the Gliders stopped reproducing because Blue Mountain could only contain so many, and a state of stagnation had been reached. This meant that Winnowill's healing skills were no longer needed, and at the time she had no other useful skills. On top of that, she and Lord Voll started to become alienated from each other, neither of them understanding the other anymore. To keep herself sane, Winnowill started causing small accidents, so she would have something to do, but the accumulating frustration over Voll eventually made her decide to leave Blue Mountain in search of the true Palace, as a gift for him. She never found it, because she found something much more interesting along the way: a starved and nearly dead troll, who had been sent by his king to find a rockshaper. She took the troll, who was called Smelt, with her, nursed him back to health and turned her full attention on him, finding it incredibly fascinating to manipulate him. She fed his needs, and when they were fulfilled she created new ones for him, one of which led to the birth of her son Two-Edge, although I am unsure whether this was a natural birth or whether she had forced conception. When Smelt finally reembered his original mission and tried to capture a rockshaper, Winnowill was so enraged at the fact that he threw away all her gifts that she destroyed him, after which she started manipulating Two-Edge, destroying his mind and dividing it, so he went mad and was perpetually torn between his troll side and his elf side. So obsessed was he with discovering what he truly was that he went as far as to set up the war between the elves and trolls just to find out what he was: elf or troll. Winnowill, meanwhile, went on with her manipulations, now turning her attention on all of Blue Mountain. Over the years she slowly extended her influence, until eventually she was the true Lord of Blue Mountain, even though Lord Voll was the Lord in name. Winnowill had sent away the preservers to keep Voll in a state of apathy, totally afraid of the outside world and completely under her control. She herself was by now basically mad because her gifts had festered upon themselves for so long. When the Wolfriders arrived at Blue Mountain, Winnowill found that her carefully built world was slowly beginning to crumble away from underneath her. She had thought to keep them under control easily, but found that she had to set them free, and then they started to destroy her control over Lord Voll. She had hated the Wolfriders from the start because of their tainted blood, but now she hated them even more for destroying her power. She was defeated temporarily, during which Lord Voll flew away in search of the Palace and was killed. The death of Lord Voll probably was a blessing for Winnowill, for now she could truly be the Lord of Blue Mountain. She now openly controlled the Gliders, keeping them all asleep except for the Chosen Eight and never allowing them to dream anything but what she sent them to dream. For three years this state continued, until one day Aroree, whom Winnowill had sent away to find preservers, returned with Dewshine's son Windkin, intending the child as a replacement for herself. Winnowill accepted the child and by this got herself into another clash with the Wolfriders. Dewshine had followed her cub, but Winnowill was able to control her by her soul name, which she had learnt three years beforehand. Winnowill 'cleansed' Windkin's blood, making him immortal, and started working on her grand plan to turn Blue Mountain into a second Palace so she could leave the tainting World of Two Moons with all pure-blooded elves, though not after killing all the tainted elves. She unexpectedly received help from Rayek, who arrived at Blue Mountain with the intention of gaining the Gliders' support for his cause (getting the Palace to fly again), but was easily lured by Winnowill into supporting her cause. It wasn't until Cutter, Leetah and Suntop arrived that he was snapped out of it and realised that he had been tricked. Still, Rayek was touched by Winnowill's vision and found the goal to be worthy, though the means were not, and loved her. Winnowill's plan to shape Blue Mountain into a second Palace failed, with it crumbling within moments of being shaped. She was half healed by Leetah, but this healing couldn't be finished with Blue Mountain falling to pieces on top of them, so she was put in wrapstuff to finish the healing later. It never happened though, as Tyldak grabbed his former Lord in his talons and dropped her on a small island in the Vastdeep Water. With this, Winnowill dissapeared from the obvious scene for a while, though she didn't keep still. She flesh-shaped herself for water-breathing and spent the next ten thousand years or so underwater, intruding on the Wolfriders with her black sendings (though these were brushed off by Venka) and amusing herself with shapechanging creatures and pestering the occasional sea-faring human. All this time she basically spent waiting for the return of the Palace, which Rayek had taken into the future after Winnowill had urged him to. When it finally did, Rayek brought the Palace into the sea and intended to let Leetah finish her healing of Winnowill. Winnowill had other plans, however. She had been tricked by Rayek and had been momentarily paralyzed by his gaze, but woke up again just when he arrived with Leetah. Winnowill screamed in outrage that Rayek had done this, as the half-finished healing had left her with all the guilt she had carefully put away over the ages, and none of the comforting madness to soothe it. She refused to let the 'torturer' touch her again and drove them away with a water-ram. She intended to flood the Palace as well, killing all inside, but was subdued by Venka and Rayek and put in a water-chamber inside the Palace, where she spent the next six or so years in some sort of suspended animation, completely harmless. This couldn't last forever, of course. She slowly regained her senses and spent a long time concentrating her powers, after which she struck when the Wolfriders were celebrating the reconciliation of some sorts between Cutter and Rayek. She gained control of the Palace and intended to fly it away, but was stopped short by Venka, who managed to sever Winnowill's bond with the Palace, so it became uncontrolled, crashed to the ground and shattered to pieces. Winnowill herself was initially in trouble, as she was still not suited to breathing air, but managed to come under the protection of Grohmul Djun himself. She shaped herself to look like a human woman and came with him to the Citadel as his courtisane, known to him as Lady Venovel. She spent the Shards war working behind the scenes. She created the peace hounds for the Djun and helped him. During the war she also revealed herself for what she really was, though it didn't have the effect she had wished. She had expected the Djun to be awestruck, but he still considered himself to be her superior, since he knew that if he ever thought it otherwise, it would destroy him. At some point in the war it was revealed that a living High One was needed to rebuild the Palace, for which Timmain was fetched by Aroree. This led to the climax of the war: a confrontation between Timmain and Winnowill. Timmain changed herself into a half elf, half wolf shape to fight Winnowill, who realised that while alive she didn't stand a chance against the High One. Because of this she convinced the Djun that he should kill her, which he did by cutting her head off. Before she could do anything, however, Rayek drew her spirit into his own body, both out of love for her and to protect her, as for the good of the rest of the elves, thus condemning himself to a life away from all his people and, worst of all, the Palace. Rayek now wanders the World of Two Moons together with Ekuar as Winnowill's living prison, and with Winnowill continuously trying to break free from him.